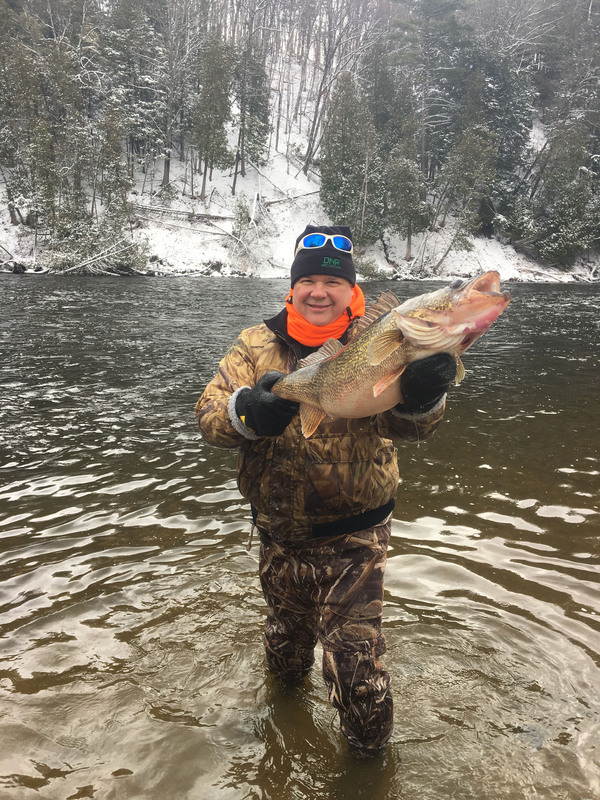 Muskegon River anglers should be on the lookout for Department of Natural Resources personnel collecting walleye eggs below Croton Dam this spring. Walleye will be collected with electrofishing boats starting as early as the week of March 27 and concluding by April 17. Anglers should exhibit caution when fishing near the electrofishing boats. Wading anglers will be asked to exit the water when the boat approaches to ensure their safety. Those who wish to avoid the walleye collection activities should fish downstream. The DNR plans to collect approximately 30 million walleye eggs from the Muskegon River this year, which will result in more than 13 million fry for transfer to rearing ponds and direct fry plants throughout the Lower Peninsula. Walleye fry transferred to ponds will be raised to fingerling size (approximately 1.5 to 2.5 inches) and stocked in late spring or early summer in lakes and rivers throughout the state. Lake Michigan and many inland lake walleye populations in the Lower Peninsula depend on the fingerlings produced from Muskegon River eggs. The size of the walleye spawning run in the Muskegon River is presently about 40,000 to 50,000 fish each year. DNR crews will strip milt (sperm) and eggs from approximately 500 adult fish, which will be returned to the river – except for 60 which will be sent to Michigan State University for fish health testing. "This adult population consists of mostly stocked fish," said Ed Pearce, DNR fisheries technician supervisor who coordinates the egg take. "The Muskegon River has the largest run of walleye in the Lake Michigan watershed south of Green Bay." Four days of fish collections are planned this spring. The actual date those collections will begin depends on water temperatures and the presence of ripe fish. This schedule can change daily for many reasons, but it is anticipated most work will be completed from the last week of March through the second week of April. 2018-WalleyeEgg-Take.jpg: A DNR employee holds a walleye used during the 2018 egg-take efforts on the Muskegon River. 2018-WalleyeEgg-Take-2.jpg: Eggs will be collected from adult Muskegon River walleye this spring.